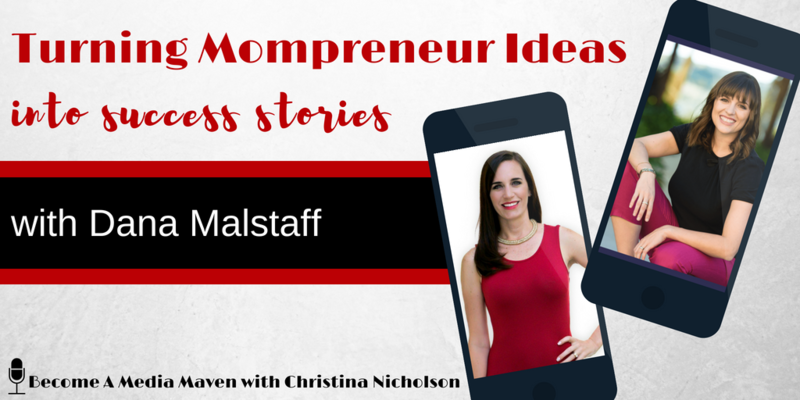 In this episode of Become a Media Maven®, I speak with the Boss Mom herself, Dana Malstaff. Dana is a business strategist who helps entrepreneurs figure out how they should run their business based on their goals. We talk how and when to set your business goals, creating your ideal environment, listening to your audience, about the consistency of habits, and how something called the “20 Mile March” is a great lesson in business… and why some thrive while others fail. We also get specific on creating action plans that produce results and how to stop doing busy work and start doing real work. In this episode, Dana gives mompreneurs a step-by-step roadmap to business success! Dana is also the host of the successful Boss Mom, and now Boss Dad, podcasts. She is hosting the third Boss Mom Retreat in San Diego where I will be a facilitator and speaker in September. Please subscribe to this podcast and leave an honest review. Your ratings and reviews really help and I read each one. Dana Malstaff, from Boss Mom, and I had a conversation two months ago. I told her I really wanted to have a podcast someday. You see, Dana is a business strategist and helps mompreneurs turn their businesses into success stories. She has some amazing advice and is great at helping people understand how they should be running their business. I recently spoke to her on my podcast, Become A Media Maven®, and these are the nine lessons outlined from our conversation. In our own lives, we fail to see how our talents can be best leveraged. We try to make really good decisions, but we also need friends, mentors, and colleagues around us to help us see through the forest. Dana said it is a really great avenue to go down and podcasting is only getting bigger, starting to outpace blogging. Having a personal brand is important and we have to be marketing ourselves. So, what better way to get people to know, like, and trust you, than by being in their little earbuds on their way to work and in the gym? You want them to hear your voice and to hear you. You want them to know your tone – your humor, the nuances of how you say things, the phrasing that you say things, and the quirky aspects about you. Those are the things that people begin to feel like they know you for and those are the things that people start to fall in love with you for… and they will buy what you have. Podcasting can truly solidify a brand if done right. One way Dana makes sure she started off on an organized foot is with Trello, a free project management and organizational tool. She is a Trello queen and the fact that she knows exactly where everything is at all times contributes to her mom success. If you want to learn how to use Trello from the master herself, click here! A few years ago, Dana found herself in this position where she wanted to be a mom and an entrepreneur… and be amazing at both. She felt very isolated and very alone. Dana moved out to California where her parents were because she wanted to be closer to her… and this beautiful brilliant thing happened. All of a sudden, everybody she met was an entrepreneur and there were tons of moms or working moms who had businesses and there was conference after conference and there were meet-ups and there were all these things and it took away that alone feeling. It’s recognizing to put yourself in the right environment or get yourself out of an environment, so you can be where you are, pursuing what you love, and what you want in life. That’s when Dana just started connecting with people and ended up getting into a mastermind with a gentleman named Azul (who helped Pat Flynn, who is also a guest on the Become A Media Maven® podcast). His experience helped me write the Boss Mom book. We were in a mastermind and he said if anybody wants to write a book, I’ll give you a massive discount. Dana always wanted to write a book because she was a journalism major. So, her and Azul sat down. She thought she was going to write a book about content strategy, but ended up writing a book about mom guilt and about this idea. What was born was BossMom, which is not a title she picked. They two hired a copywriter to help brainstorm 25 titles to the book. Then, they picked out three. It originally was Mom Boss, then flipped it to Boss Mom. It was Dana’s least favorite, but everybody loved it. Then she had design covers for the book and everyone picked her least favorite, which is now the Boss Mom logo, which is a true testament because she has fallen in love with it. From there, Dana was doing the exact same thing she had been doing for the previous two years from content strategy and business strategy without making really consistent income… at all to exploding. If you get it right, those things can solidify a brand that shoots you to the top. “I tell people to start a podcast before you write a book, 100 percent, because you can,” Dana said. One of the beautiful things about a book is it gives you clarity on your brand, on your message, and on what you want to say. It’s an amazing experience, but a podcast can do that too, and a podcast allows you to bring experts on that will potentially be clients, collaborators, or influencers. So, you’re getting on their shows and getting invited to speak at their events. These relationships allow you to share your message, and unlike a book that is a stagnant message that isn’t ever changed, it becomes a calling card. Your podcast can be new information – you can constantly promote new things and do new things and those stay around forever so you can call people back to old episodes. It’s so much more rich in its content and those things start picking up SEO in the show notes for those topics. The Boss Mom podcast is very successful and Dana has great guests talking about business and motherhood, so she started one for dads too! Dana wanted to claim it before somebody else did. Dana said there were just so many cool guys, or husbands of women in the community, who weren’t getting support or the space to talk about not just how businesses are grown and how to do that, but how to integrate that with being a father. Dana has steadily, organically created a great community of Boss Moms. She got to 10,000 in the Facebook group within a year and are past 30,000 now, but she doesn’t want it to grow too fast because she needs to be able to manage it well. You can’t flood in people who don’t understand how the community works and Dana monitors that. With so many so-called business coaches out there, Dana is a true business strategist, or blind spot reducer. Dana loves challenging people and she loves being challenged. When she created the Boss Mom community, that’s what she wanted – a think tank where we could all challenge each other. It’s almost like a focus group of your ideal client to help make decisions in our business. What keeps people from really being successful in their business is making decisions. Dana thinks we feel guilty as moms and as entrepreneurs. When people talk about work-life balance, we worry about it because we’re not confident we’re making good decisions about where we’re spending our time and who we’re spending our time with. When you are busy at work, you feel guilty and when you’re at home and not getting things done at work, you feel guilty. If you felt really confident about the decisions you were making, then you wouldn’t feel guilty. You would say no. The more that you feel like you understand the environment and the pros and cons of things around you, the more equipped you feel to make decisions, therefore, guilt has no place where confidence lives. A lot of what Dana does is help people map out what their business looks like, map out what their sales funnels look like, and what they should be doing during the day because that can be leveraged the most. When it really comes down to it, Dana has a ton of content with more than 20,000 people in courses – from small to big because that was where she first made money (in online courses). She helps people make confident decisions in their business so that they can not only be successful but feel good about it. Dans has a life coach that she recommends to many people because she can hear blocks people have – how they feel the world is internal, how they see the world, or how they’re portraying themselves from a brand perspective. For example, someone will say, “Oh, well my brand is this customized one-on-one thing, so I can’t make an online course because it’s not customized or one-on-one, but I want to pay you to help me make a course.” That’s when Dana tells them that they’re never going to put a course out. They’re literally going to stall on creating it forever. When we can use really good questions to lead people down their decision path – why they make decisions, what they actually want, where they want to go, what it looks like, and what they could do every single day to get there – you can get people into the things they need to do every single day to take action… and systematically what they need to do every single day to get results. “I talk a little bit about how we leave corporate America and we almost shun all corporate America things because we must do it differently, have an authentic business from the heart,” Dana said. “Then you have a ton of people trying to run businesses that they’re not getting any success from because they’re not methodical and they’re not really understanding how their actions link to results. We can try to be helpful all day long with rogue blog posts or rogue podcast topics, but if we’re not really doing things that guide people down a journey to true action, then you’re just being helpful without being impactful and then no change ever happens. Dana talks with people to understand what they need and then she says: This is what I hear; this is what you need to do; let’s do it and let’s take some action. That’s so important. It’s what every single person who even thinks of starting a business needs because you need that outside perspective. We have a really hard time continuing to recognize our true priorities because we don’t link everything we’re doing to the result that we want. I just need to be on social media; I just need to be doing this because everybody else is doing it; I just need to be doing webinars; I just need to have courses. The fact is, not all of us need those things and most of us that are going to end up having those things need to do them in a particular order for them to be successful. There’s a logical way to build businesses while still allowing ourselves, from a woman’s perspective, to be emotional and authentic, but come at things from a very logical, methodical, focused space. That makes all the difference because you can totally waste your entire life trying to build a business and be online and never, ever get anywhere. There’s a big difference in doing what you want to do and doing what you need to do. And lots of people, they want to do the fun stuff – the branding, the photo shoots, and the pretty website. They think all of that will eventually lead to money when really you have to be making sales, getting on phone calls, going to networking events. It’s not fun, but that’s what you have to do to grow a business. The other stuff is just extra stuff that will help you along. One of Dana’s favorite examples is something called the 20-mile march. There were two groups that were trekking up a mountain. One had the methodology that when they were tired they rested and when they were energetic they would go until they couldn’t go anymore. So they would do 40 miles a day and then everybody would be tired and they would rest. So there’s a lot of inconsistency. The other one did 20 miles every single day. If they were tired, they did 20 miles. If they felt like they could do more than 20 miles, they still stopped at 20 miles every single day, rain or shine, sick or healthy, every single day. At the end of the track, half of the people on the inconsistent team died and everybody on the other one reached the summit. Consistency always wins. It’s a consistency of habit, not a consistency of content. The consistency of habit always wins. Dana writes one promotion email every single day; she does two outreaches every single day; she has two follow-ups every single day, that might be a follow-up to a proposal or a follow-up to a connection for the podcast, for example. Those three things help her establish her business. If you created a consistency of habit for things and the small tasks that you knew would drive your business forward, you would create a consistent habit that leads to success. That’s what we don’t do enough as entrepreneurs – we just don’t create a consistency of habit. And you can see the people who are really successful have done that and they do it well… and they stick to it. In September, I will be speaking and facilitation at the Boss Mom Retreat in San Diego. It’s all about collectively leveraging our strengths to solve problems on a system-wide level. It’s not just about moving our businesses forward. We’re doing things that collectively move mom entrepreneurs forward. Dana’s goal is for everybody to cry once, laugh once, walk away with an inside joke, walk away with a client, and walk away hiring somebody. Eighty percent of the women who leave Dana’s events say they’ve gotten tangible business. Can’t make the retreat? You can still benefit from other meetups! To get tickets to the Boss Mom Retreat, click here. Con grat U la tions Christina. That’s fantastic. I hope the Power of Pat empowers your Podcast career.